I just finished the first book of yours I have ever read (not the first you wrote as I understand it): Sixty Days & Counting. WOW! That was a compelling read! I liked how you build up each character slowly and how the story was told from various people's perspectives from Phil Chase to little Joe. Fantastic! Can't wait to add more of your books to my personal library right along side David Eddings! Thank you! J'ai lu les 3 livres mars la rouge, la verte et la bleue, et ils ont littéralement changé ma façon de voir les choses. Le système politique, basé sur l'éco-économie, est vraiment passionnant. Bien que ces livres soient un peu longs parfois (les parties avec Ann me semblent un peu ennuyeuses), et qu'à d'autres ils ne le soient pas assez (certaines technologies sont peu décrites), la globalité de la trilogie est vraiment géniale. Kim Stanley est à mes yeux un génie, et j'espère qu'il va poursuivre ses talents d'écrivain, sociologue, économiste et scientifique amateur. I am trying to track down a story about a geographer in ancient Egypt who met a feathered alien spaceperson, all of which led to the Egyptians' religious part man part animal gods, and also in it was the pharos of Alexandria. I think it was by KSR. Does anyone know? That definitely doesn't sound like anything by KSR; you might want to try posting at http://whatsthatbook.com/. I m enjoying this ''science in the capital'' very much... although Frank's considerations are bit lenghty and i felt like something is missing in the 'conversio'. It might sound odd, but your fiction brings much more reality to the environmental issues than all the serious stuff i may read. Not so odd you may tell since that's what well writen fiction does...bring in the emotions without which there is no full human experience of reality. But still odd for I still can feel reality in fact based litterature. The cause i'm sure is the optimist (or proactive) stance in the novel. It's too often that my hearing / reading on these issues is hampered by what i feel to be an undercurrent of resentment wishing to resolve in catastrophes. I had a look at wikipedia concerning the THC slowdown and the little ice age before feeling like to get to know what you would say after what seems like researches telling it might not be, let's say, as big as that... is this article tampered by the ''Climate change does not exist'' afficionados ? Do you know of any source that is vulgarising on environment without that gilt that sours so many discourses, steaming my glasses. s big as that... is this article tampered by the ''Climate change does not exist'' afficionados ? Just wanting to find out what was the source for KSR's thinking in defining the ten forms of change in music and physics in the Memory of Whiteness? See specifically the "brief listing and definition to the main kinds of developing operation" on page 83. A couple of decades ago I read KSR's story "A History of the Twentieth Century, with Illustrations". Much of it consists of a travelogue around Orkney, and in particular the neolithic village of Skara Brae. Ever since I've had this desire to visit the place, and now I finally did it. It is hard to describe why I feel such a strong connection to those neolithic sites, but in a way it was like half-seeing the invention of civilization, a cultural revolution that brought about technological and ideological concepts that we now take for granted. In any case, I'm not sure this is the proper forum for this, and I apologize if it is not, but I wanted to share this. I've put some pictures up (http://www.flickr.com/photos/ml42/tags/orkney/), and a blog post (n Portuguese) http://ml42.blogspot.co.uk/2013/08/queen-mary-university-of-london-londr..., so people can have some idea of what I've seen and why it affected me this way. I just finished 2312 and I found it so compelling I couldn't put it down. I think the author's love and fear of humanity is in tune with the anxiety all of us feel right now- troubled times that we could all participate in fixing. I thought the outpouring of technical data alongside the fiction or even scifi fantasy to be in good balance, very enjoyable. An amazing prediction, on par if not surpassing Nostradamus's prediction of Hitler (Hisler). You only missed by a few miles. A newly-published book on California becoming an independent nation is available on Amazon.com, called "California's Next Century." I saw while researching this book that you had already written on topics about the future welfare of this great state. I was hoping that you might be interested in this book, and would consider posting a comment about it on the Amazon.com site. I am more than willing to send you free copies of the book at any time. As an appetiser to Shaman can II recommend 'Spirits of the Mothers' by Cristi Fernández Narvaíza? This pseudo-scientific book highlights the plight of our ancestors 15,000 years ago. The chapters skilfully alternate between a narrative followed by facts, figures and the author's conclusion. I read it in one sitting and wished other science based books used such style. I look forward to Shaman with this little book's knowledge in mind. Memory of Whiteness digital edition? Does anyone know if it is possible to buy a digital copy of memory of whiteness anywhere? I mostly only read things on my phone these days because I always have it with me. Knowing Jackie's character, it seems natural for her to single out *female* body mutilation, most likely forced upon them by men, rather than bodily mutilation in general -- I don't think a character's words have to be taken as KSR's opinions always. On religious freedom being enshrined in the Dorsa Brevia document, I'm guessing there must be an article or clause stating that self-determination over one self takes precedence over all else, including religious freedom. I would have to check the Dorsa Brevia and the Mars Constitution to make sure. I remember a lot of power going to women in Blue Mars, mainly due to the Dorsa Brevia Group and Jackie. I don't remember that necessarily "most" decisions went to women, however I would have to check. KSR has mentioned woman empowerment (and widespread access to contraception) as perhaps the best way towards social justice and battling climate change, so this is something he talks about often. But apart from the Mars trilogy I don't remember him writing about how it would come about in other works -- it's just there, naturally! There's a lot about gender in 2312, and in the short story "Sexual Dimorphism" (The Martians); there's some of it from the evolutionary psychology point of view in the "Science in the Capital" troligy too. i wanted to buy the mars trilogy, but in amazon there's only mass market paperback versions. anyone knows where can i order not a mass market version? I need to contact Mr. Kim Stanley Robinson. It's urgent for me and I need help with finding his e-mail address at least, or any other method to contact him. Hi, my name is Greg. I've surfed the web through and couldn't find any trace of Kim Stanley Robinson, which as I know was published via your agency. The question is about translation his books into Russian and publishing them in Russia, but still I cannot find neither him, nor his lobbyists. If you can help me somehow, please respond via the e-mail. Hi all! I read the Mars series back in college, and was impressed by the way that the technology in Red Mars seemed to be well-researched, based on the technology of the day. I'd like to ask KSR -- what would he change about that, given the events of the last fifteen years? The retirement of the shuttle program in particular and the unavailability of external tanks to build the [i]Ares[/i] would be an obvious place to start, as would the relative rise of China and India as spacefaring powers. Does KSR still believe that it's plausible for the first man on Mars to have been born in 1976? Hi, my name is Greg. I've surfed the web through and couldn't find any trace of Kim Stanley Robinson. The question is about translation his books into Russian and publishing them in Russia, but still I cannot find neither him, nor his lobbyists. If you can help me somehow, please respond. Hi, my name is Greg. I've surfed the web through and couldn't find any trace of Kim Stanley Robinson. The question is about translation his books into Russian and publishing them in Russia, but still I cannot find neither him, nor his lobbyists. If you can help me somehow, please respond via the e-mail. I heard a reviewer on NPR recommend 2312 as their best SF pick for 2012. How right they were! I just finished the audiobook version and I cannot begin to express how amazing this book is. The quality of writing, the vocabulary, the science (hard and social), the characters, the "scenery", the use of Lists and Extracts, the Quantum Walks... all conspire to weave an extraordinary tale. This must sound a bit like a gushy fanboy, but I am 54 and have been reading SF since grade school. This is some of the best SF ever! Thank you very much Mr. Robinson!! Why John Boon dies in the beginning? And which is the exact year of the landing - 2027 according to 9 months flight from 21 Dec. 2026 or 2037 according to John Boon's calculation of year M 10 - 2047 when the truck falls? I love the Red Mars trilogy and was re-reading it, when I came upon something that Jackie said in Blue Mars: she mentions that if they allow individual towns and cultures too much autonomy, they could end up with a place that practices (gasp) female genital mutilation. I'm wondering why KSR singled out female genital mutilation, and didn't mention male genital mutilation? Non-consensual circumcision is practiced by Judaism, and earlier in Green Mars the character create the Dorsa Brevia document which unthinkingly enshrines the right to religious freedom, without any mention of how to protect young boys and girls from having their bodies mutilated. If KSR were to write these books today, would he still have Jackie single out only *female* circumcision and make no mention of the plight of young boys in these same cultures? future phenomenon (possibly quite desirable if the truth be known). 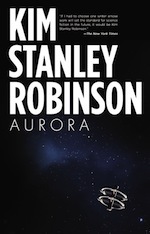 Please, how can I contact Kim Stanley robinson? I was recently reading the Aurora book (which, by the way, is AMAZING), and it was mentioning pretty early on that the ship in Aurora is 12 magnitudes smaller than Earth. Since it is hard for the human mind to fully conceptualize the size of our world, I was trying to use Google to figure out how small, exactly, is 12 magnitudes smaller than Earth. I couldnt find anything useful online, so I was wondering if somebody here could help me out with some comparison (My research lead me to believe that 12 magnitudes smaller than earth is the size of bacteria, which it awfully small for a inter-solar space ship). How does he do research? How does he do his research for the science in his books? They re so well researched, I;d love to know how. I ve been a voracious reader of fiction for years and nothing has spoken to me the way your writing has. I just want to say thank you. Thank you for writing novels that allow me to escape and dream. Thank you for making characters that I care and fear for. Thank you for using your novels as a means to prompt discussions about some of humanitys biggest issues. I would love nothing more than to buy you a beer. I ll likely never have such a pleasure so I ll hope you ll read this comment one day. I just finished Gretel Ehrlichs "This Cold Heaven" about her trips to northern Greenland and life among native people there. Climate, landscapes, vegetation and people are all evocative of the KSRs Mars books. The Inuit who (at the time of of writing - late 90s) were still doing subsistence hunting from dog sleds and kayaks trying to stave off a growing market economy, outboard engines and snowmobiles and worried about global warming....Good book! Wonder if KSR read it? Surface would be more relevant than volume in our case. Thats about 7 orders of magnitude. Lets look at it by volume. The volume of the earth is 1.08*10^12 km. So I guess 12 orders of magnitude smaller would leave a volume of 1.08 km. That still seems a small for so many people but in bacteria sized. Is there any way to get in touch with Mr. Robinson? Id like to share with him an idea I have for a book about our first contact with a different civilization and see what he thinks. The novel would cover 250 years, but the events that happen in the book are based on real events just changed from the past into the future to give a different perspective. In some ways I think this is a book that I would like to read and would like to know if KSR is interested in lunch to hear me out. Im in Mountain View area. I was also at the conference about terraforming Mars at Moffatt Field and talked to the Mr. Robinson then, and when ask to read an excerpt from Green Mars he borrowed my book from the audience. Afterwards we talked about the fate of Hiroko at the end of the Blue Mars book. hoping to find one..... not for a bothersome reason.